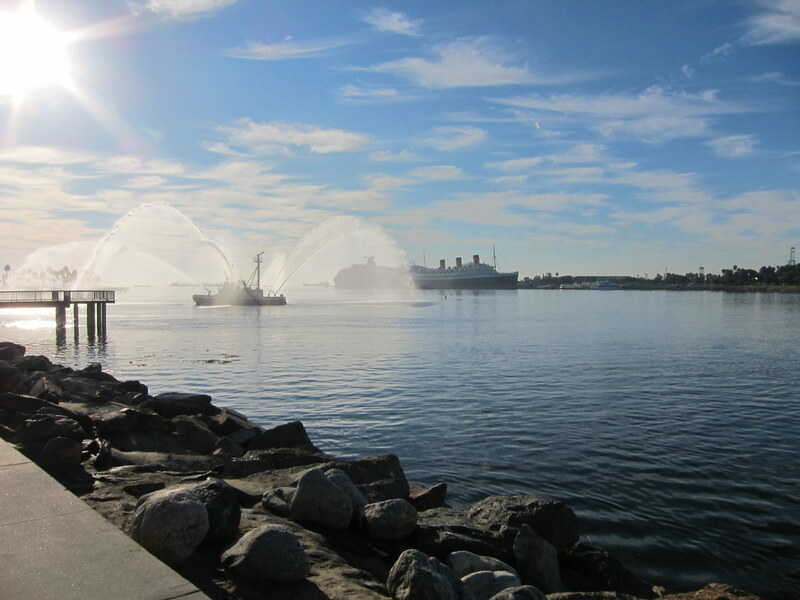 On Sunday, the Green Girl ran the Long Beach Marathon. My longest training run was scheduled for the evening before I flew out to the East Coast for Tour DaVita. I had planned on doing 20 miles but had to cut my run short to 14 when production issues came up at work. When I returned from the bike tour, Coach Steve helped me put together a pacing strategy for the race. 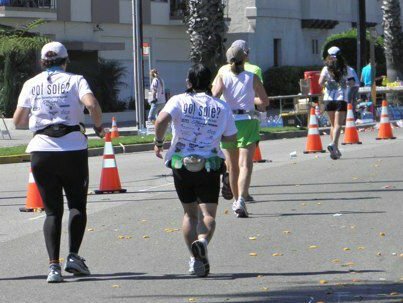 Our goal was for me to do a sub-6 marathon. That would require me to shave just over an hour off my marathon PR. Race morning, I carpooled with my SparkFriend, Jeannie, to the Starting Line. 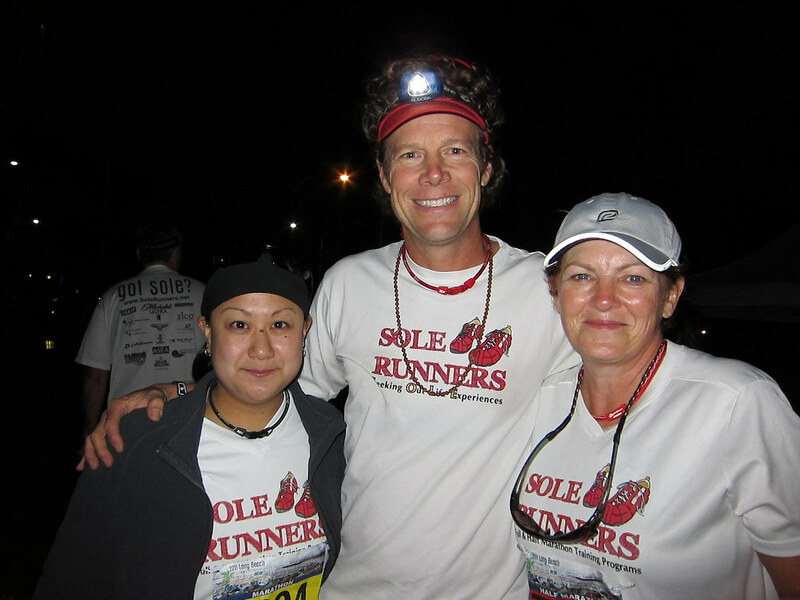 She lined up for the walker early start and I headed over to the Sole Runners tent. 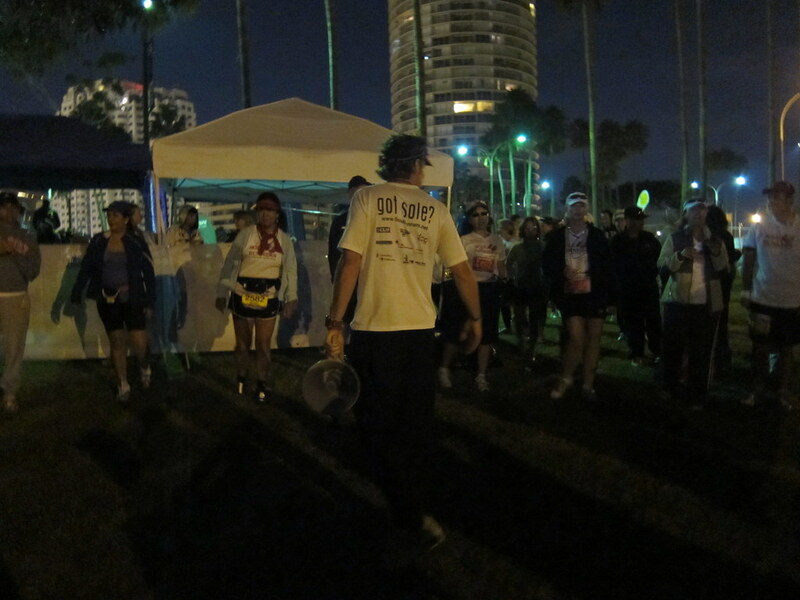 When it got closer to the race start, Coach Steve assembled the group behind our tent for our body looseners. We ended with a Sole Runners team huddle before we all headed for our respective corrals. True to form, I had to visit the porta-potty a few times before I felt confident enough to line up in my corral. Mr. Green Garmin was programmed to help keep me under a 13:44 average pace for a 05:59:59 finish. 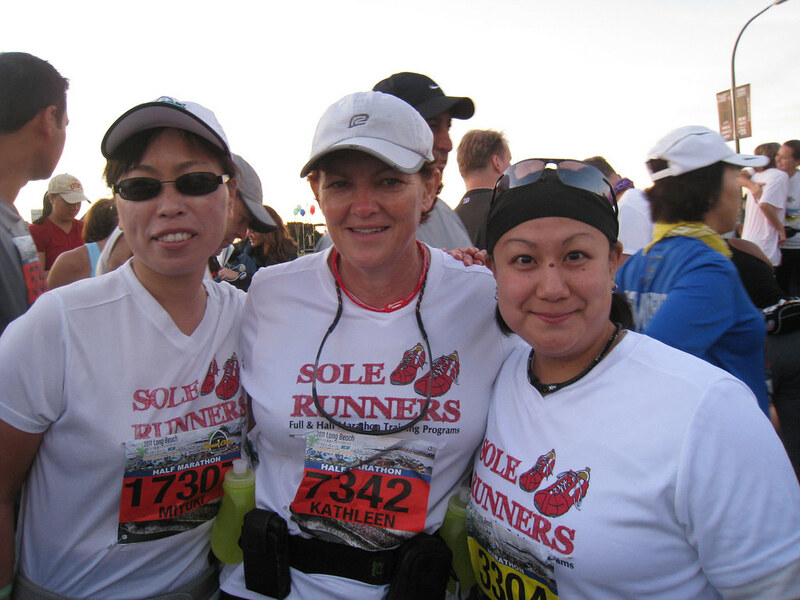 I chatted with other Sole Runners as we waited for our Corral 5 wave start. As soon as I crossed the Starting Line, I turned on my running playlist, zoned out all the other runners so I could find my pace, and tried to convince myself that I didn't need to pee again. I refused to allow a porta-potty line destroy my sub-6 dreams so I finally gave in around Mile 2 and resorted to ducking behind a vicious bush that stabbed and scraped up my knee. I felt much better after my pit stop and I quickly eased into a comfortable pace. My body felt really good and my legs felt strong. I stopped by the Sole Runners Mile 9 aide station briefly and grabbed some of The Green Girl's Famous Salted Potatoes prepared by Sole Runner, Betty. 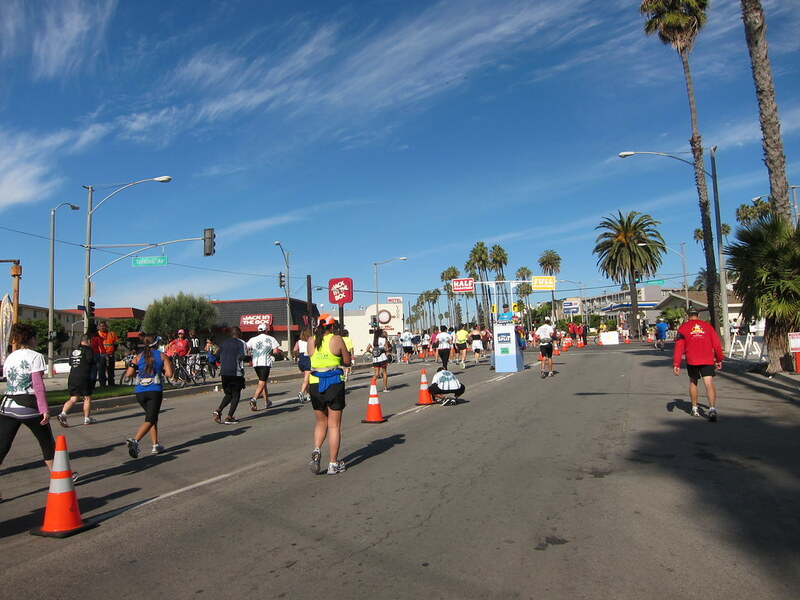 At the infamous Half/Full Marathon split, I followed the bend to the right. All of a sudden, I had intense metatarsal pain on my right foot. I had a serious heart-to-heart with my right foot and I let it know I needed it to work with me. It stopped hurting. I was overjoyed when I saw I had reached Mile 13 in 02:39:16. The sun was starting to get hot so I increased my sports drink intake at the water stops. Despite the heat, I was able to maintain a fairly consistent pace and I reached Mile 18 in 03:47:41. I slammed into the metaphorical wall at Mile 21. I knew the time had come to pull out my Sole Runners Secret Weapon so I reached into my pocket and opened it up. This was my opportunity to do a sub-6. I took a deep breath, dug deep, and pushed on. Out of seemingly nowhere, HillBilly Yoga appeared. I appreciated the fresh legs and easy conversation. I watched the 05:30 pace group go by but I didn't have it in me to keep up with them. Mile 23 was the longest mile of my entire life. It was so long that I gave in to one of the hills and walked. I was suffering from hypoglycemia at this point and it was a struggle for me to maintain any semblance of a conversation. All I could think about was crossing the Finish Line and then getting some sugar - in that order. Mr. Green Garmin read 05:45:26 when I crossed the Finish Line. My official time was 05:45:21. Everything came full circle for me when I crossed that Finish Line. 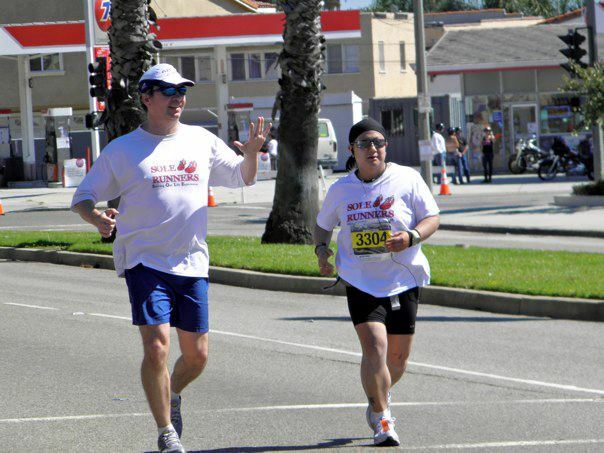 I followed the Couch-to-5k program and completed my very first race at the Long Beach 5k back in 2007. I remember watching the half and full marathoners crossing the Starting Line. I was simply amazed and wondered if I would ever be capable of doing something like that. I also crossed two items off my Running Bucket List - outrunning Mr. Green Garmin's battery life and running a sub-6 hour marathon. 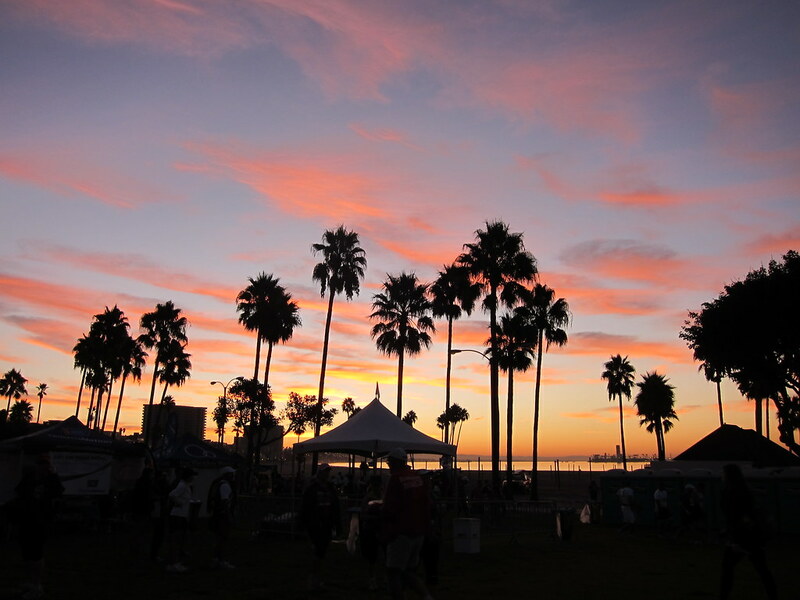 You rocked it during our track workouts and brought to the marathon. When I ran with you for a 1/10 of a mile between mile 25 and 26 you were in the zone. It might have been the pain zone but there was no stopping you. Great work this season. Congrats Mary! So happy for you. Beating your goal by 15 minutes is huge. Be proud of yourself!! WooHoo Mary! 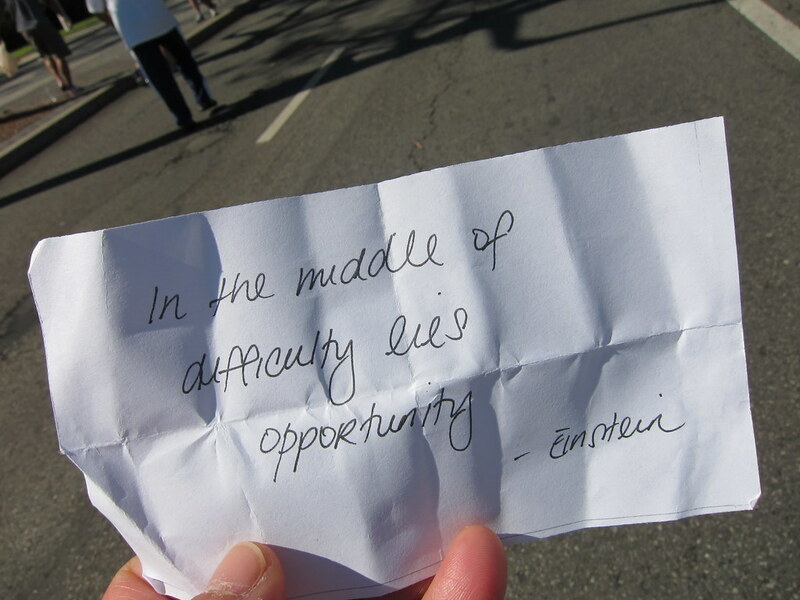 Sounds like a tough day but you pushed through and reached your goal. Congrats! WOOHOO! What a PR, congrats!! Wow - that's a MONSTER PR - Congratulations! Sounds like you nailed your plan, despite some challenges along the way. Way to dig deep and get over the 'Wall'. You're killing it on the bike and on your feet - way to go. You made my day when I got your text!! FANTASTIC race, Greenie...so freaking proud of you!!! Beautiful sunrise photo. That heat can be a bummer. Way to go on your run! You are a machine. 260 mile bike tour and now a marathon. Congrats on your new PR!!! You are awesome! I am so happy for you reaching your goal, not only reaching it, but beating it! Way to go! Good to know too that I'm not the only one to duck into the bushes. Great recap. Sounds like you have a wonderful group and coach. Congratulations!!! LOVE! Congratulations, Mary!! You're so inspirational! Congratulations! A PR in the heat....you ROCKED it, Girl!!!! Woo hoo!!!!! Way to bring it!!!!!!!! Congratulations. Congrats on such a huge PR!! Great job! That's was a terrific run and way to push through the inevitable WALL. GO GREEN GIRL! You did it! Sweet! Congratulations! Virtual high fives all around! Oh My Gosh!! I love how you knocked off two goals in one race!! I'm so proud of you!!!!! Way to go!! Congratulations on beating your goal! Congrats! I love Coach Steve's comment, you must have really worked hard for this! What an AMAZING accomplishment! Congratulations! A sub-6 marathon ... that's my goal! Thanks for the motivation, and keep them coming! I've been thinking about you the last few days. Hope all is well!